The RadNavigationView's header and footer parts are fully customizable. This article will demonstrate how this can be achieved. RadNavigationView's header can be customized with the following properties: PaneHeader, PaneHeaderTemplate and PaneHeaderHeight. Example 1 demonstrates how you set the RadNavigationView's PaneHeader property. It is possible to further customize the header by setting the PaneHeaderTemplate property. The DataContext inside the PaneHeaderTemplate will be whatever is set to the PaneHeader property of the RadNavigationView. Example 2 demonstrates how you can set this property along with the PaneHeaderHeight property which controls the height of the pane header. 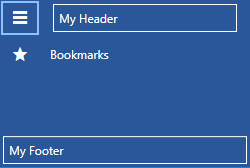 The pane header's Background and Foreground can also be changed with the PaneHeaderBackground and PaneHeaderForeground properties. RadNavigationView's footer can be customized with the following properties: PaneFooter, PaneFooterTemplate. The approach for doing so is identical to customizing its header which is described in the previous section. RadNavigationView has a RadToggleButton next to its header which allows for expanding or closing the navigation pane. This button is specially designed to show RadGlyphs ,since it has a RadGlyph in its ContentTemplate. You can easily change which glyph is displayed by setting the PaneToggleButtonContent property to the desired glyph string. Example 4 demonstrates how this can be achieved. If do not want to show a RadGlyph as the Content of the toggle button, you can modify the PaneToggleButtonContentTemplate as demosntrated in Example 5. The Pane Toggle Button can be customized further by setting the PaneToggleButtonStyle property. It can also be hidden by setting the PaneToggleButtonVisibility property.